Have you lost more deal than you have won in your business? Would you like to convert every prospect customer that comes to your office? The goal of every business owner is to expand their business and strengthen brand reputation in the market. However, with every other business competing to do so, creating a lasting and positive impression has always been a struggle for the majority of entrepreneurs. While there are many way you can do to enhance growth for your business, uplifting your reception desk with unique architectural design and plan could be the ultimate solution for your business. This post explores modern reception desk design ideas that would take your business to the next level. Why Your Business or Office Reception Design Matters? Why do people focus on looking good when meeting a new person? Whether you are attending a job interview, a business meeting, a date or any other special occasion, you ensure that you are well groomed. Why? Because the first impression counts! People will judge you with the way you look, and it can make or break your deal. This applies to your business reception area too! The reception space in your office or business represents your brand, and can make or break your business. Every person coming to your business; customers, new employees, potential investors and prospects among other visitors will form a first impression about your entity based on the reception area. 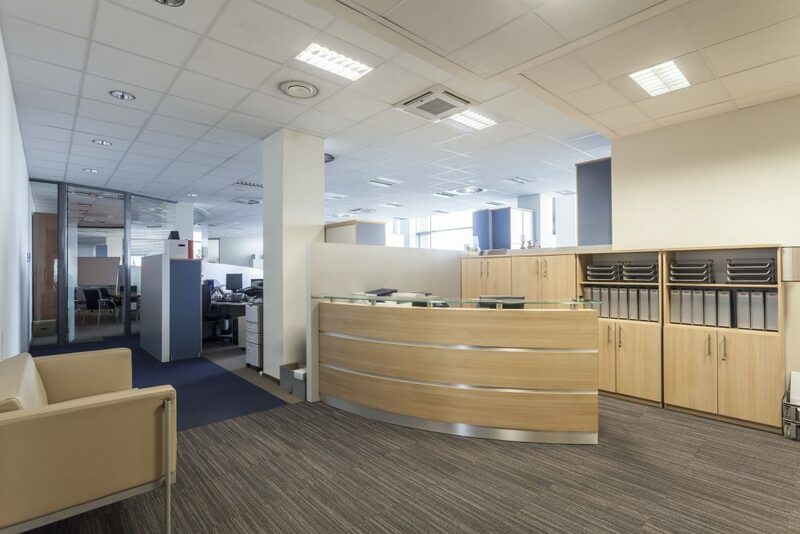 Unfortunately, most business reception area comes as a late addition, and never given priority when planning for office redesign and renovations. If you want to attract valuable stakeholders to your business, then you need to ensure that the reception desk is attractive and welcoming. Besides, “first impression lasts and can be hard to change!” Interestingly, a professional and attractive reception design has more business value that you ever thought. Your lobby and reception space is the link between your visitors and other units of the company or organisation. Therefore, it can be used to create and sustain strong relationship with your business stakeholders including suppliers, clients, potential partners and professional consultants among others. Moreover, a perfect reception desk can emphasize your brand values, thus attracting new business. 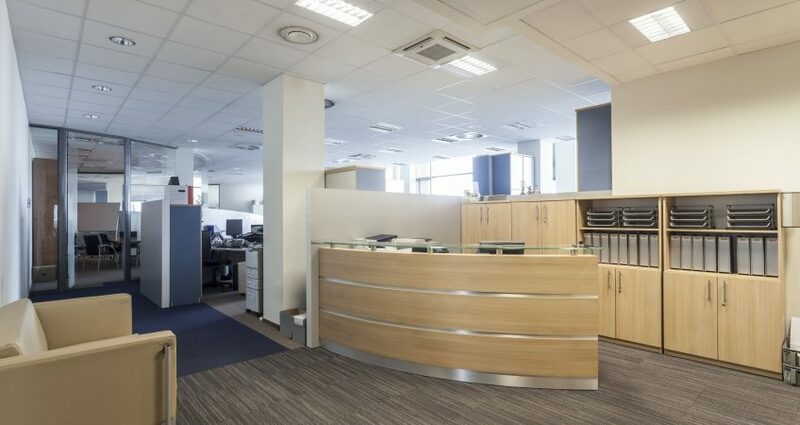 Did you know that your reception contributes to employees’ productivity? A clean and lively lobby space can be a source of inspiration and motivation for your employees. It creates a positive and productive workplace, and keeps employee morale high at all times. Seeing the company mission and vision every time employees get in and out of the office is also important as it keeps them focused on their duties. You can utilize the reception space to tell your brand story and communicate your company values and culture. This will involve strategically incorporating your brand logo, office interior theme, and corporate values into the design to create an impressive experience for everyone visiting your business premises. Office space can be limited for all your business need. A modern reception desk design can help you use the space efficiently, therefore creating more space by sharing opportunities such as huddle area and phone rooms. However, the design should be not crowded and accommodate the needs of all the business stakeholders. For your business to earn more revenue, you need to attract new customers and retain existing ones. Doing so has been the major challenges for many brands. Your reception area can be one of the most cost-effective marketing tools, enticing prospect clients even before you engage them. It communicates your brand promise, as well as portrays your professionalism. This differentiates you from competitors. Additionally, having comfort seats, a video display unit, a self-service drink machine, and reading material keeps your visitors comfortable and entertained. This increases your chances of closing more sales. 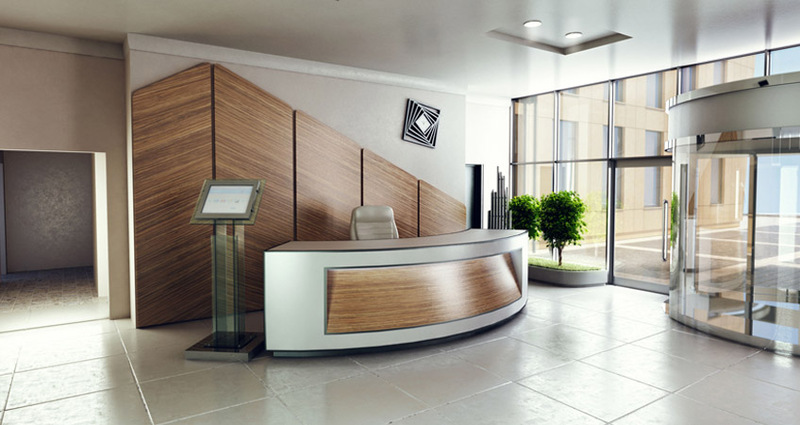 What Do You Consider When Choosing a Perfect Reception Desk Design? Is it hospitable for staff and visitors? Is the design a true representation of the brand and business value? Does it give the space a professional tone? Every design element should be in sync to warmly welcome your guests, and make them want to spend more time. It should be spacious, clean, and well-organised with comfortable seats and entertainment features. In addition it should be spacious to accommodate front office employee(s) depending on the size of the company to encourage maximum productivity. Also it is important to ensure that the desk design blends well with your brand values and corporate culture. This ensures that the architectural design and plan for the reception area works in harmony to market your business and displays the level of your professionalism. You should position the reception desk in a strategic position where guests can locate it the moment they enter your premises and a clearly defined path on how to get there. You may use decorative carpet to mark the path to the desk. Besides, the desk layout should regulate traffic to avoid any confusion or congestion. Comfortable seats – Affordable coaches or reception chairs, so that customers can sit comfortably as they wait to be served or for a scheduled meeting. Tables – It can be awkward and uncomfortable while your guests are trying to fit everything on their hands or laps. A table can be a good solution for the customer to place the reading material, complete paper work or placing the company offered coffee. Hooks – To standout, you can invest in hooks for bags, umbrella or coat racks. This not only frees the guests from holding baggage, but also makes them more belonging and confident. You need to select furniture and fittings wisely to ensure that their styles and colour complement the overall design. You have the option to choose from a variety of flooring materials including wood, ceramic tiles, and carpet among other styles. However, it is important to consider the cost, maintenance and the safety aspects of the choice. Ensure that the reception desk is well laminated with just enough light that does not disturb the space occupants. Soft white bulbs work the best. It is important to keep your visitors busy and entertained. You may have an artwork, trophy and award cabinet, TV screen, Magazines or books to keep your clients busy as they wait. You may even have a self-service drink machine. You need to provide document storage to help your front desk staff remain organized. You can also design a reception desk with a display space to show case your products or projects. A large and personalized reception desk with a clear display of your brand name and logo can be a great way of grabbing the attention of visitors within second and create a lasting impression. For aesthetics and luxury, you can go for shiny and durable materials, but always allow the design to communicate your character by keeping it clean and organized. There are a wide range of materials to choose from depending on your budget and preference. You can use granite desks to give your reception a sleek look as well as show your customers your value for a great appearance. Wooden reception counters are also more affordable options that can give your business the reputation it deserves. It is important to consider the durability of the material of choice to maintain a new look for the reception area without frequent repair costs. 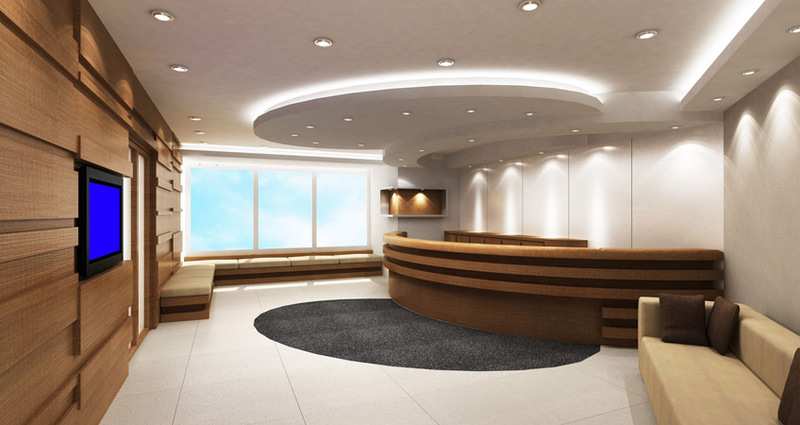 Simple reception area designs can make the space more attractive and welcoming. Use minimal details and simple colour schemes to make the entry point more open and less cluttered. It is also a great way to show your professionalism. Spend a few coins to make your lobby area more attractive, you may have an inspiring wall hanging, a plant, or an artwork. This will display the human side of your brand. Take the opportunity to market your brand by ensuring that your company logo is visible and well lighted. You may laminate the logo to ensure that it draws attention of the audience. You should also ensure that your brand colours are well featured in the designed and awards displayed to tell your company story without much effort. Having the latest reception desk design ideas can be a sure way of differentiating your brand from others and showing your unique qualities. It gives you an opportunity to display your brand message and win new clients instantly. However, you need to creatively combine the different elements of design to achieve a comprehensive brand harmony. If you need professional design assistance, Architectural Design and Plan can help you come up with an inviting modern design for your business lobby area.